This fabulous piece of mail art came to me all the way from Australia, from the creative gal behind Goodnight Little Spoon. She is, in fact, a member of the International Union of Mail Artists, and her professionalism shows. I mentioned in my response to her that I was just sort of amazed that the Australia Post didn't get confused by all those awesome foreign stamps. Somehow I figure the U.S. Postal Service wouldn't be tickled about that, but I love the effect. Woodpecker stamp! I think the envelope is handmade, and the paper has this kind of silky, creamy feel while still being very fibrous. I had to open most tenderly with my letter opener, in order to keep the envelope intact. But I appreciate a good challenge every now and again. She blogged about this letter right when she wrote it, and I do encourage you to check out that link because she shows some wonderful photos of what she calls "mail tag." 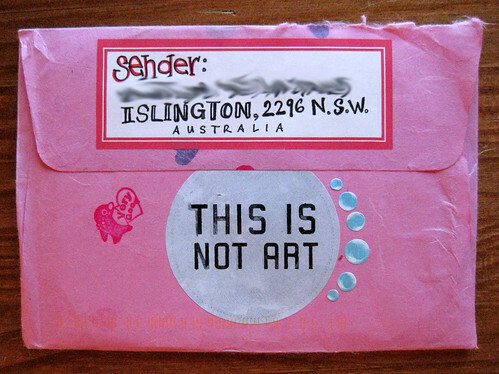 She sent me some mail tag, and it is a fabulous idea, I highly recommend it. It's a wonderfully creative and interesting way of exchanging information with people, and comes in especially handy with new pen pals when you're getting to know each other. And beyond the mail tag, it was a heckuva fine letter. 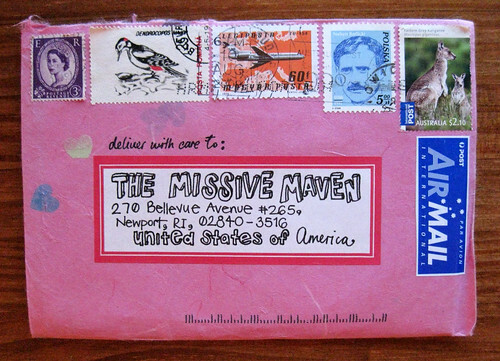 I do believe Miss Spoon posts her address right on her blog, so she's another one of those mail addicts like myself who is open to surprises from all corners. When I was 19 years old I sent an ex letters I would send in hand made envelopes and the post office actually delivered them to him lol. I would just fold note book paper into the shape of an envelope.Making an envelope can be easy to do. But this correspondent of yours was all the more creative with her Caligraphy or block letters she used on the address part of the envelope. that is awesome and really pretty in my opinion . 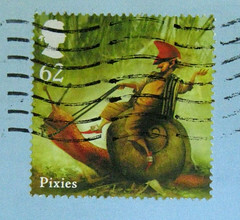 Love the foreign stamps always have . great blog thanks for sharing . I love the stamp selection!